The real story of today’s episode is that Lara Parker needs a break every once in a while. Angelique just joined the show a week and a half ago, and she’s absolutely dominating the storyline. She’s been in seven straight episodes, wreaking a different flavor of havoc every day — kissing her boss’ fiancee, strangling a toy soldier, spiking the drinks, and generally manipulating everyone in sight. But you can’t keep that up forever without a break, so Angelique gets an episode off, and the show shifts into neutral for a day. So Natalie and Andre engage in a typical information management session, using a classic two-handed Mulder-Scully formation. Natalie insists that Josette and Jeremiah were in a trance; Andre is skeptical and doesn’t want to hear her occult gibberish. The added value of this scene is that David Ford has decided, as usual, that he’s only going to memorize half of his lines, and he’ll fill in the other half with whatever occurs to him at the time. Natalie: Andre, I don’t think she knew what she was doing last night. Andre: Nonsense! It was obviously a conscious act on her part. You think she knew that this man was going to be here, waiting for her? 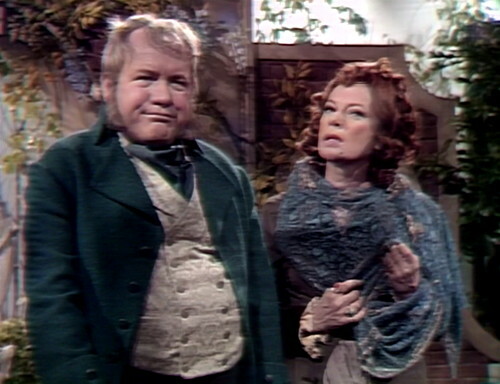 Andre: Well, then, she knew very well what she was doing, then, didn’t he? I don’t know why he ends that line with “didn’t he?” I don’t think he knows either. It’s just one of the many poor acting choices that David Ford makes every day, beginning with agreeing to be on a television show in the first place. He moves upstage and stares off into the distance, in the direction of the teleprompter. It doesn’t help. Natalie: She was behaving very strangely all evening. Andre: That’s putting it charitably. That line just straight-up doesn’t make any sense; it’s possible that he’s reading from tomorrow’s script. Natalie starts looking off into the distance as well. They might as well just turn the camera toward the teleprompter, and let us read the lines ourselves. Natalie: It was as if she’d been placed in a trance of some sort. 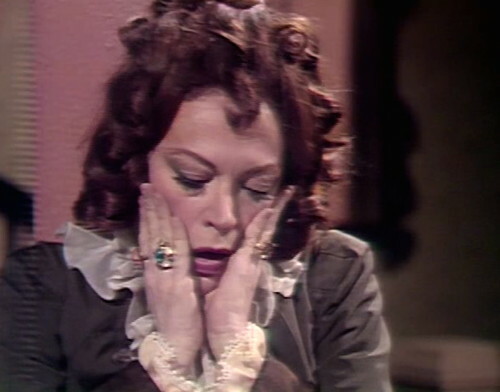 Andre: Oh, now… don’t start that mumbo-jumbo of yours! Natalie: There is no other explanation that makes any sense! Andre: Well, that one doesn’t make any sense either. Which pretty much brings us back to starting positions. Andre decides that he’ll talk to Jeremiah, and make sure that the thing that he’s not convinced actually happened doesn’t happen again. It turns out Jeremiah doesn’t really understand what happened either, and he was there at the time. Andre: Give me an explanation. Jeremiah: There is no explanation. I don’t know why it happened… it just did. Jeremiah: I know that’s hard to believe, but it’s true. I went out for a walk, and before I knew it, I was standing in the garden, waiting for Josette to come to me. Andre: Did you know she would? Jeremiah: Yes, but… I don’t know how I knew it. That’s the strange part about it; it just happened. 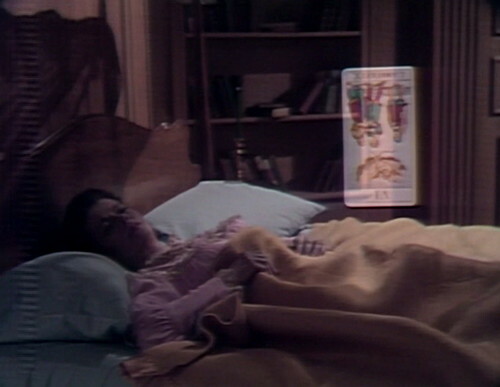 Fortunately, Dark Shadows has access to some extra information sources that normal soaps don’t, and here’s one of them: tarot cards. 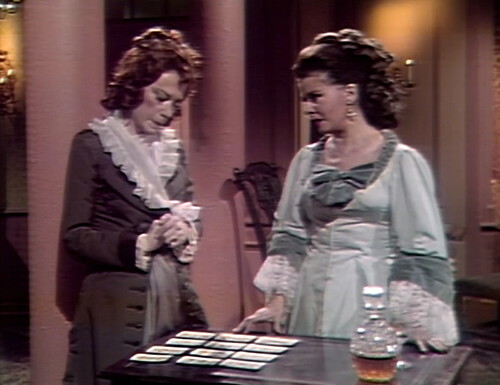 In Natalie’s first episode a week and a half ago, she did a tarot reading for Barnabas, and discovered that “a wicked woman” is trying to bring them all grief. As far as I can tell, that line doesn’t make a bit of sense, but there’s nothing we can do about it; we just have to sit here and take it. Naomi is trying to keep up. Naomi: Does every card have a different meaning? Natalie: No… but the meaning of each card is directly in relation to the card that it’s near. At this point, Naomi stops asking questions, because obviously it’s not going to get her anywhere. Natalie studies the cards for a moment, and then gasps, her hands flying up to her face. She seriously needs to stop playing with these cards if they’re going to upset her this much. 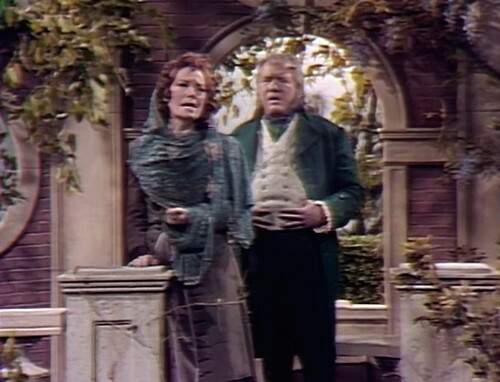 Once again, we’ve got the lovers — obviously Barnabas and Josette, and their upcoming wedding — but it’s inverted, which is a sign of separation. On the left, the Lovers are next to the Death card, and on the right, there’s the Chariot, which brings the revelation of a betrayal. I’m not sure why the Chariot means a betrayal, but they’re Natalie’s cards. Maybe she got the bonus expansion pack. The interesting thing, for our purposes, is that we’ve had two tarot card readings so far, and they’ve both been exactly correct. Nobody accuses Natalie of being a witch, but clearly something supernatural is going on. We know that Natalie’s interpretation is correct, because we know about Angelique’s plans — but we would have known that the cards were right anyway, because that’s the only reason why you’d have tarot cards on the show in the first place. They don’t need to spell that out; it’s triggered automatically by the audience’s innate sense of narrative. We don’t think of Natalie as a witch, because the same thing would happen if any random character started flipping over cards. Soap operas are all about information management, and the tarot cards are another information source. They’re a plot accelerator, and they have a direct line to the writers’ room, so we trust them. The last sequence takes that concept a step further. Naomi is asleep, and she’s dreaming about the mysterious tarot cards, with a voiceover narration from Natalie. 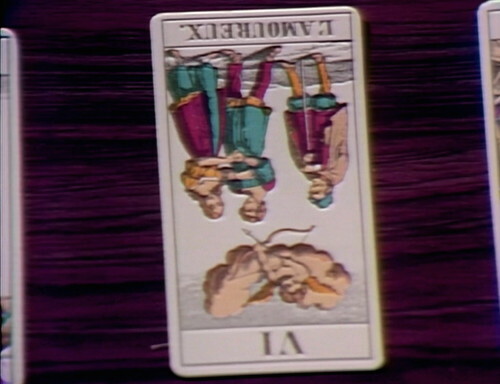 At first, it’s just a repeat of lines from the previous scene — the Lovers are inverted, the Death card indicates the end of a relationship, and so on. This is going to be another one of those random prophetic dreams, like the dream that David had when he learned about Barnabas sleeping in a coffin in the basement. But this time, the dream isn’t sent by a ghost or a vampire. As far as we can tell, she’s being haunted by the power of the cards. Continuing the dream, Naomi walks downstairs, and sees Jeremiah embracing a woman. 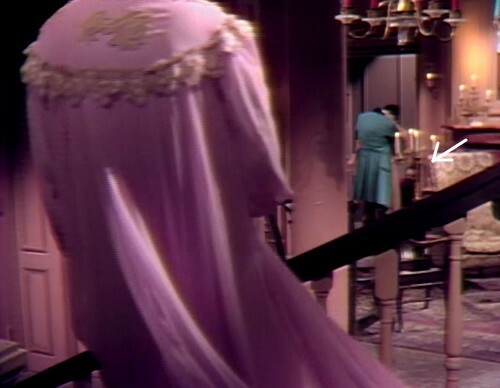 The woman is Josette, obviously, but we don’t see her face, because Kathryn Leigh Scott isn’t working today either. 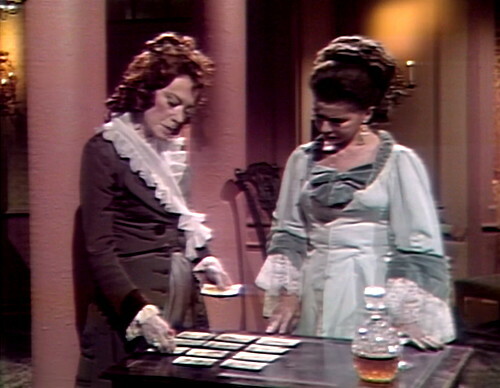 There’s a stand-in for Josette — it’s actually Dorrie Kavanaugh, who was last seen as Phyllis Wick after the seance at Collinwood. She doesn’t sound like Josette at all, but I guess we’re supposed to assume that the real Josette is off starring in her own dream at the moment, and this was the best they could do at short notice. At this point, things start to get a little weird. … And the arm comes off, leaving Naomi holding the bloody stump. That may qualify as the goofiest Spectacle cliffhanger they’ve done so far. They’ll top it eventually, but this is a new benchmark for crazy. Naomi Collins, ladies and gentlemen. Let’s give her a hand. When Natalie and Andre are talking outside, the camera tilts too much and you see the top of the set, and a studio light. It happens just as Andre is saying, “Nonsense! It was obviously a conscious act on her part.” This is also the moment when Andre and Natalie start to drift off book. In the drawing room, when Naomi asks Jeremiah, “You’re disturbed, aren’t you?” — there’s a clatter offstage which sounds like a stool being scraped on the floor. After that, you can hear footsteps, and something is dropped on the floor. 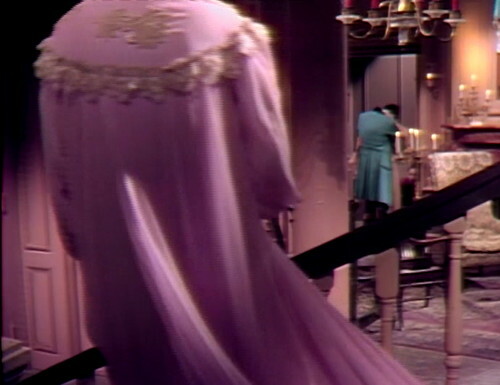 As Naomi comes downstairs in the final scene, you can see a stagehand crouching behind the embracing couple, ready to do the severed-arm gag. He’s clearly visible on screen for more than ten seconds; check out the picture below. This is Dorrie Kavanaugh’s last appearance on the show. She appeared in six episodes, mostly as a stand-in for Maggie in dream sequences, starting in May 1967. 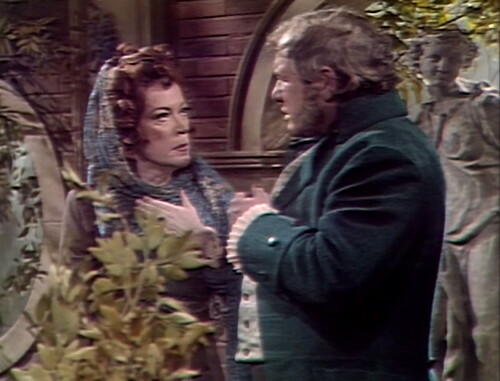 The set where Josette and Jeremiah had their tryst is referred to as “the gazebo” on Dark Shadows websites, although that doesn’t really look like a gazebo. Does anyone know where that name came from? Is it ever mentioned on the show? 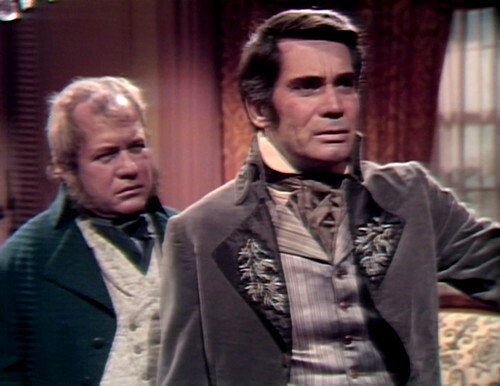 David Ford performed much better as Sam Evans in the early ‘pre-Barnabas’ episodes. He was more affable and had a better grasp on his lines. He seemed genuinely caring of Maggie and came across as a friendly but troubled character. I really felt sorry to see him struggling so much during his last episodes on the show. Oh my goodness. When Naomi pulled out that arm … I don’t think laughter is the effect they were going for. 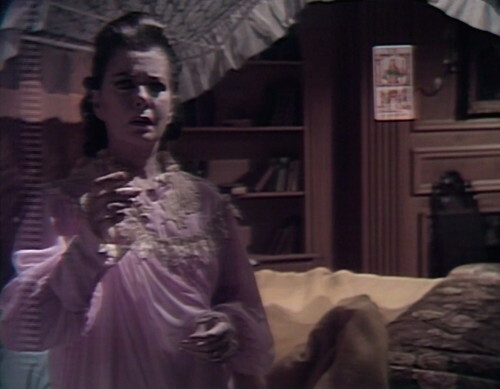 The pillow cases on Naomi’s bed look thoroughly modern….not like 1795 at all. Presumably back then any pillow cases would have been hand made. Yet it looks like a member of the production staff walked over to Macy’s and bought these. The gazebo is mentioned on the show, but much later on. I wasn’t that bothered by David Ford’s performance – I thought it was ok – but maybe I’ve just gotten used to him. And I was not expecting the arm to come off, so that actually was kind of an effective ending for me. Once again Anthony George dislays 0 emotion in his scene with Josettes father. He should try to steal some from Grayson, she’s so overboard so often. Yes, for a couple more episodes, at least. 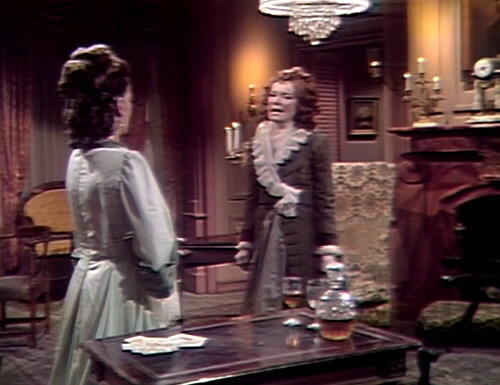 This is the episode, I believe, where Natalie first casts suspicion on Vicki. Anthony George is showing anguish that is indistinguishable from his having eaten a bad clam. This pattern will continue in tomorrow’s episode.